I don’t know if NJT buses will be part of my jurisdiction yet, but this system fascinates me in how dysfunctional it is – I could talk about how awful NJT is for hours. That’s why whenever I happen to ride one of their routes from beginning to end, I’ll give it a little bonus review here. 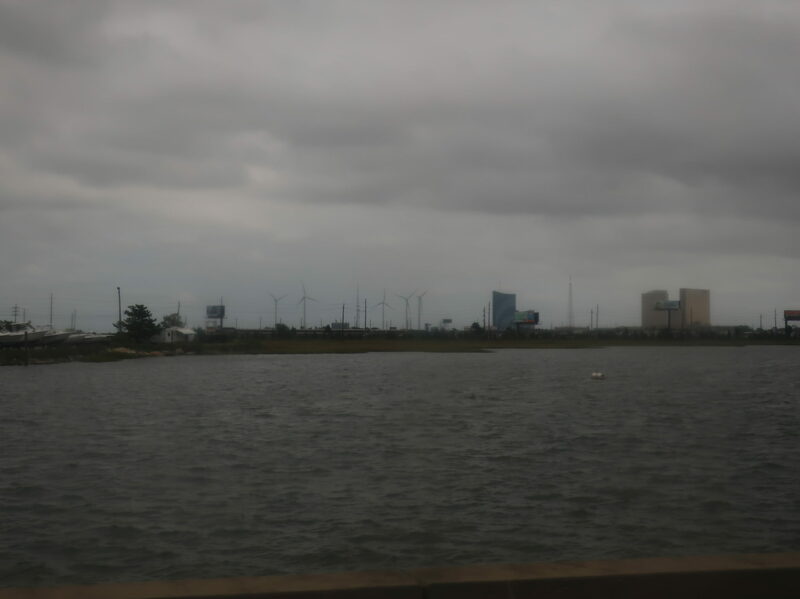 Today, we’ll be taking a trip to beautiful Ocean City on the 507! Mm, gotta love these high-floor buses! Many routes begin at City Center Park at the intersection of Atlantic Ave and South Carolina Ave, and the 507 is one of them. 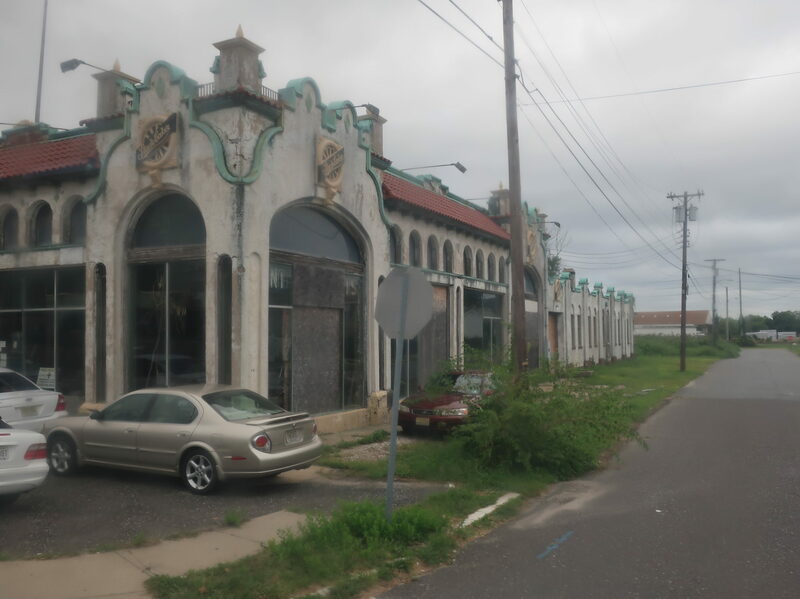 This was the, er, less desirable part of Atlantic City, and Atlantic Ave had a lot of uninteresting businesses and parking lots along it. Once we got to the stop outside the Bus Terminal, though, we had reached the more high-end part of town. The very wide Christopher Columbus Boulevard. 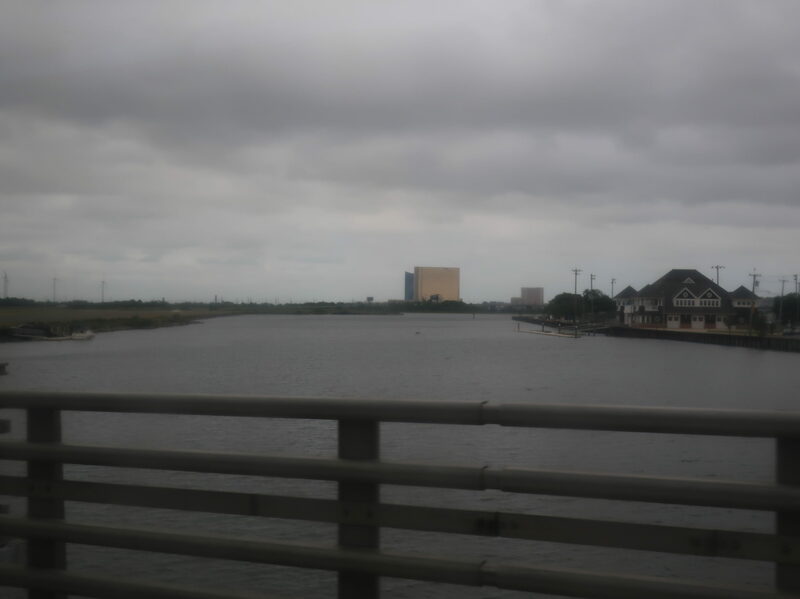 The glamorous part of Atlantic City is mostly concentrated around the beach, so we were back in a regular neighborhood very soon. The businesses were now in nice brownstone buildings, and they included some cool hole-in-the-wall restaurants among some of the more boring places like convenience stores. Some of the huge hotels of the beach were in view as we went through a park with the Atlantic City Monument in it. I was sitting on the wrong side to see the monument, so here’s some water. We turned onto Albany Ave outside the monument, crossing over a little river. On the other side, there were a ton of car dealerships, Surf Stadium, and what appeared to be an abandoned airport. 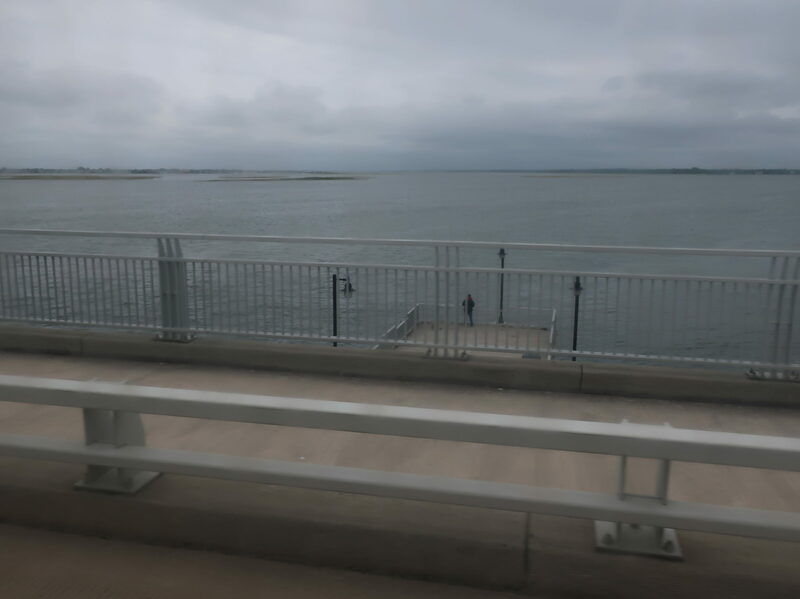 We crossed another body of water onto Great Island, which had two gas stations and a full-on highway interchange just to serve the Atlantic City High School and facilitate u-turns. Looking across the flat expanse to some wind turbines and casinos in the distance. Up and over another river, and we were in open marshland, now in the town of Pleasantville. There was a lighthouse that appeared out of nowhere, then the wide road went by an endless sprawl of crappy motels, sketchy businesses, and abandoned buildings. Eventually some side streets started showing up, and we were in a real neighborhood again. Who knows what this place used to be? It’s a nice building. 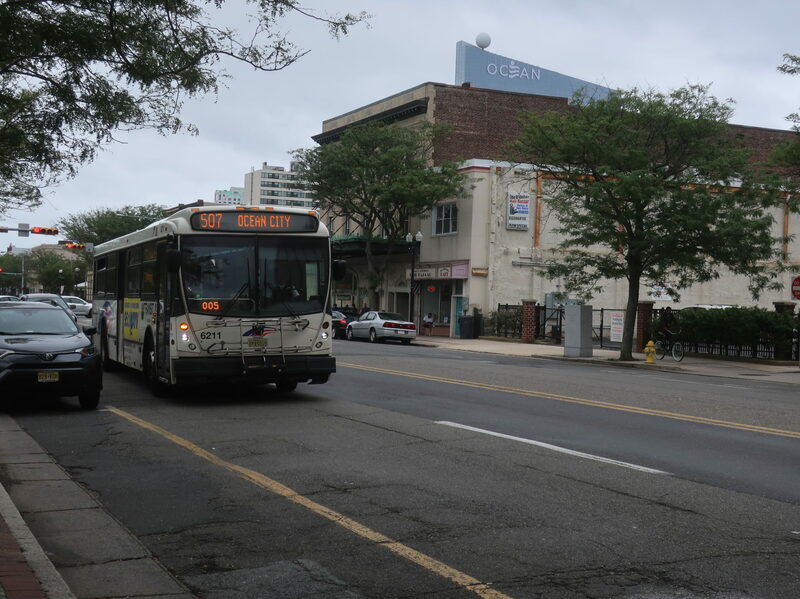 We made a one-block jog onto West Jersey Ave to serve the “Pleasantville Bus Terminal”, which was just a rail station converted into a bus shelter. After serving that, we turned onto Main Street, going through “downtown” Pleasantville. Vacant buildings, anyone? And things didn’t get much better past downtown. Main Street just became a sprawl of ugly suburban businesses. It did eventually switch to houses when we entered Northfield (and when the street became Shore Road), but we were driving so quickly that it all flew by. 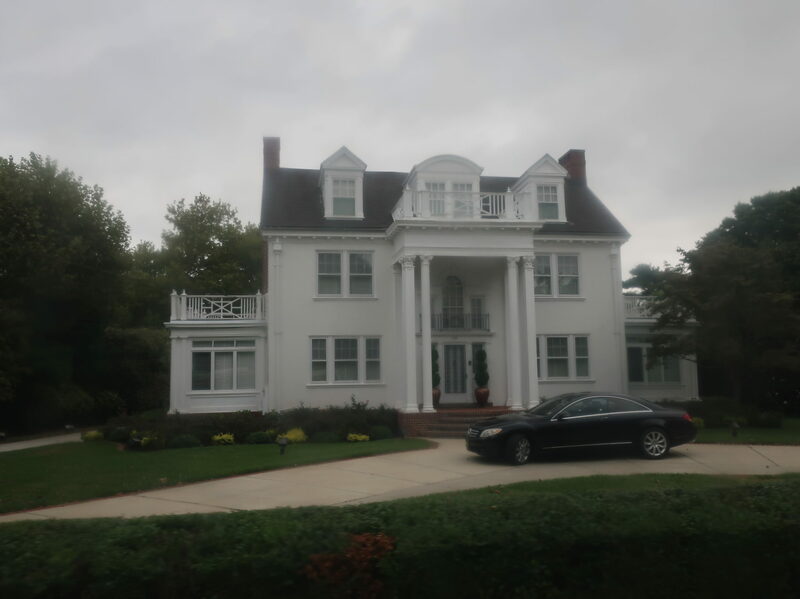 The town of Linwood was also a ton of houses, plus a country club, a park, and a bit of retail. Wow, this is a nice one! We entered Somers Point, and there were yet more houses. However, some more stuff started to come up among the homes, including some businesses, apartment complexes, and a hospital. 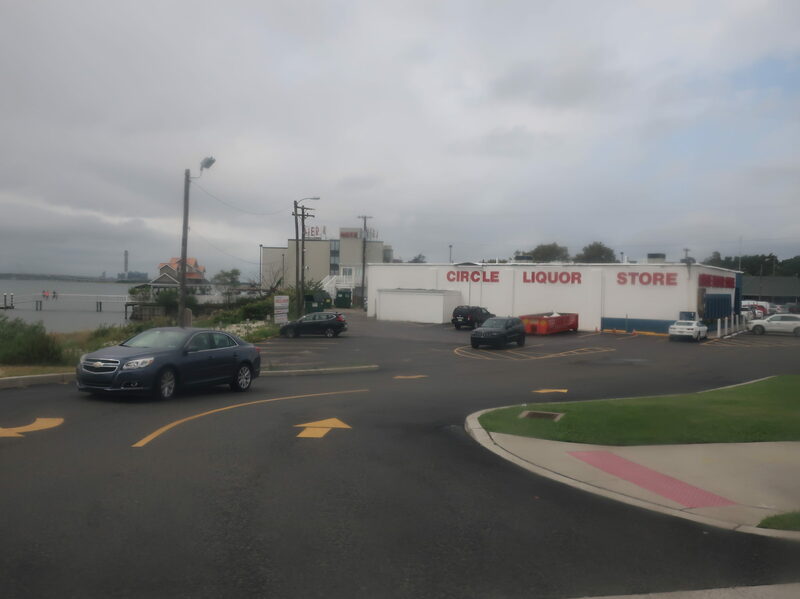 There was suddenly a ton of retail at the intersection with MacArthur Boulevard, including the Circle Liquor Store. Why is this worth mentioning? Because it’s the last one before Ocean City, where liquor stores are illegal. Dry town, baby! Now it was time for the long series of bridges off the mainland and into Ocean City. There was a lot of darting in between little islands on this road, with some spectacular views whenever we crossed the water. 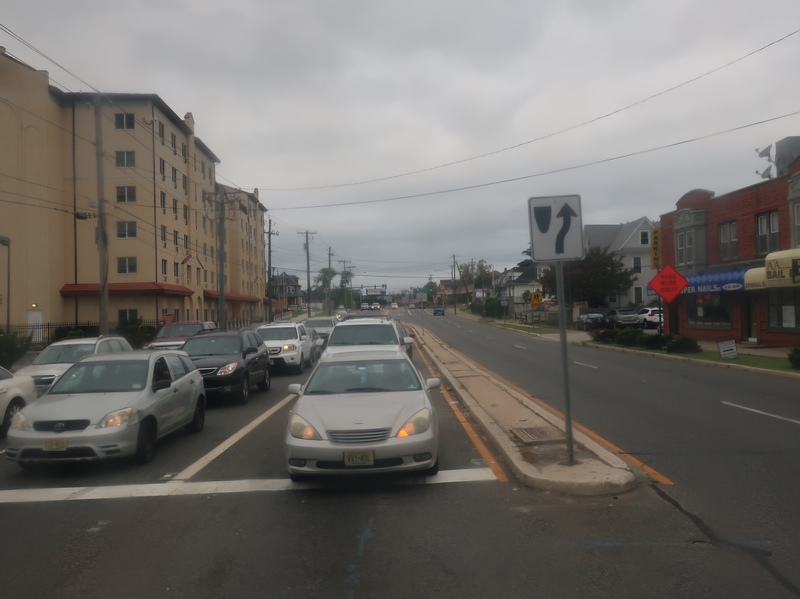 Eventually, we reached Ocean City on 9th Street. There were dense houses on the immediate side streets, but the wide 9th Street was lined with businesses, from a paint shop to a beach shop to a mini-golf course. As we got closer to the beach, the street got narrower, and there were lots of hotels to be seen. We turned onto Atlantic Ave, and this is where my friends and I left the bus to hit the boardwalk. 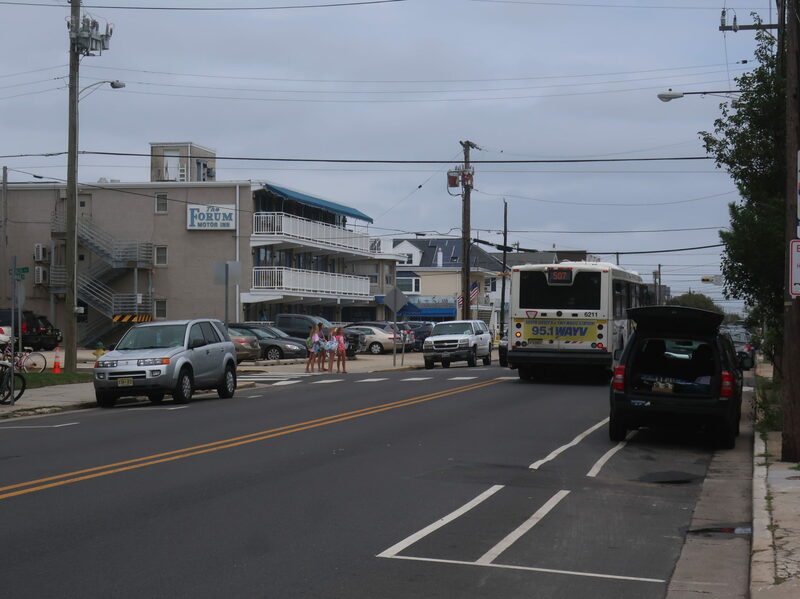 The bus would spend a few minutes looping back around to the Ocean City Transportation Center, which is in an old train station, similar to Pleasantville. Going back around to the terminal. Ridership: NJT doesn’t provide ridership for its individual bus routes, so we’ll use my count from on board. Let’s see here…wait, 50 people? Wow, for a mostly suburban journey, that’s pretty darn good. It also never got too crowded, so everyone always had a seat at any given time. 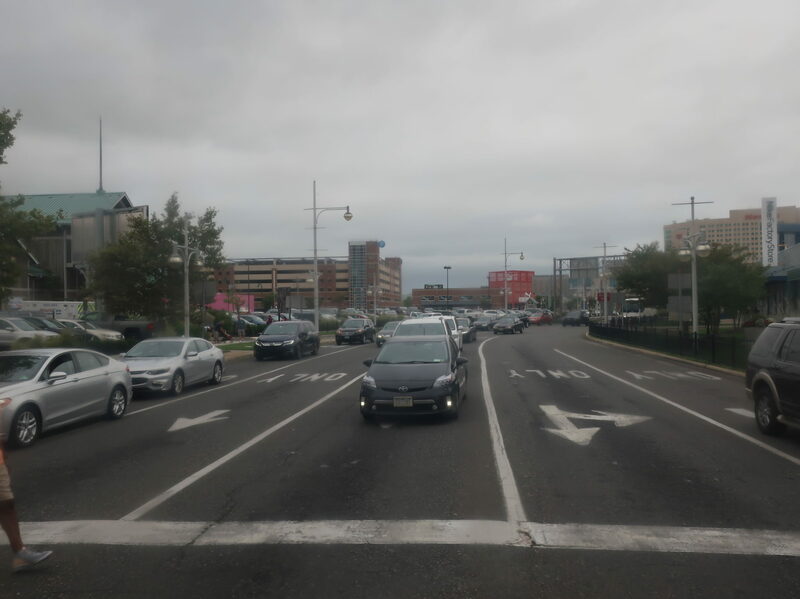 Pros: This is the most consistent connection between Atlantic City and Ocean City (the 509 does it too, but only on select trips), and it runs all the time. Literally…the 507 runs 24/7 service! It’s consistently every hour no matter what time of day it is, with increased frequency to Atlantic City in the morning and away in the evening. Interestingly, this happens on weekends, too, and I wonder if it’s for people working at the casinos, which certainly are still open during those times. I also like how the 507 has just one variant (two if you count the night trips, which just go directly to the Ocean City Transportation Center, but it’s not that drastic of a change), keeping it simple, which NJT often doesn’t know how to do. Cons: That increased frequency is a bit strange. Sometimes it’s a clean every half hour, but other times the gaps range from ten minutes to forty minutes. There doesn’t seem to be any rhyme or reason to it. Also, the 507 has zoned fares, because it’s NJT! I will say that this is a pretty good route for them, since two out of the three zone changes are water crossings, but we do get an arbitrary one on the mainland section. Finally, and this is a very minor nitpick, if the Saturday and Sunday schedules are exactly the same (which they are), couldn’t the route timetable just use a “weekend” schedule instead of printing the same schedule twice? Just a thought. Nearby and Noteworthy: Ocean City is a much more “family-oriented” beach compared to the madness of Atlantic City’s boardwalk. It costs $3.35 to do the full 507 here, but I would say it’s reasonably worth it. Ocean City even has its own boardwalk that’s a ton of fun. Huh…I was hoping I could really tear apart my first NJT bus route, but this one is actually not bad. The inconsistent schedule is the worst part of it for me – the route’s only other problem comes from my distaste for zoned fares, but at least water crossings make for logical fare boundaries, and it is a long route. Other than that, the 24-hour service is fantastic, and it’s a pretty direct ride over to Ocean City. Yeah, I actually like a New Jersey Transit route. Put it in the record books! Nice review. Come on up to North Jersey and ride a PABT line during rush hour to see some real crazy stuff. I was an NJT bus operator for 5 years before switching over to rail as an assistant conductor a couple months ago. Thanks! I’m amazed at how frequently those PABT lines run. It’s a shame they’re all so EXPENSIVE, though! Miles, you obviously I assume, don’t want to cover New York Metro Area NJT buses, but (only) if you want to, if you just cover the buses numbered 300-599, those are the Delaware Valley NJT buses. I’ve thought about that. We’ll have to see how my SEPTA progress goes before I start adding too many things to jurisdiction. Since Philly is in the middle of everything, it can escalate quickly!